I loved this salad! How fun and different and lovely-looking. There are recipes all over for this salad (starting with Bon Appetit and then here and here)…I just modified based on what I had in my kitchen. There are a few too many ingredients in the original, and I can’t imagine that I really missed out on the coriander seeds. Preheat the oven to 400 degrees. Toss the carrots with plenty of olive oil, cumin, salt and pepper. Roast for about 25-30 minutes, depending on your carrot size. Mix the dressing ingredients – 1 T. olive oil, 1 T. red wine vinegar, juice from one lemon, and thyme. Slice the avocado and drizzle with any excess lemon juice. 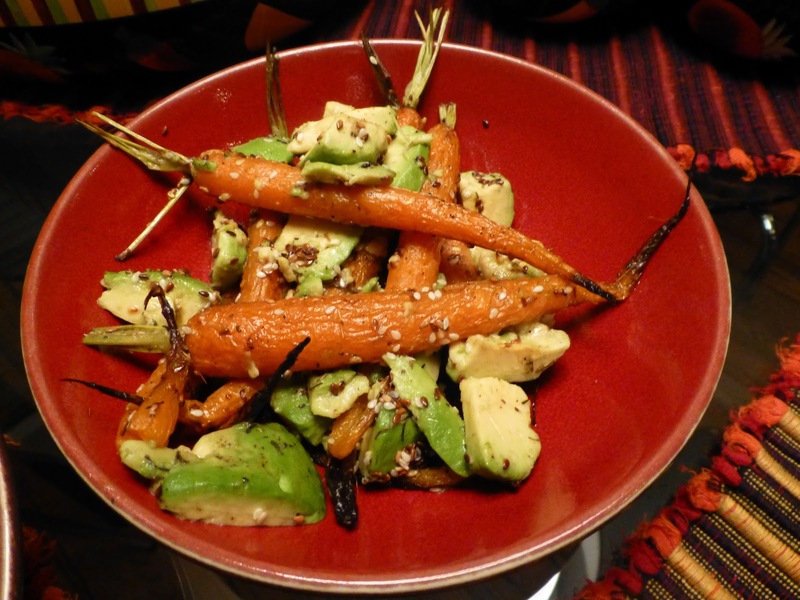 Toss the carrots, avocado, dressing, and sesame seeds in a bowl and serve.